SWEDISH FREE PRESS SOCIETY NUMBER ONE OBJECT OF HATE FOR SWEDISH JOURNALISTS……. – The Tundra Tabloids……. SWEDISH FREE PRESS SOCIETY NUMBER ONE OBJECT OF HATE FOR SWEDISH JOURNALISTS……. I received the following in an email from the founder of the SFPS, Ingrid Carlqvist, pictured in the photo below. It really shouldn’t come as a surprise that the highly fossilized monolith of Swedish journalism should be against an organization demanding freedom of the press, for all. They, the Swedish MSM, consider themselves to be the ‘vanguard of truth’ and the embodiment of free speech in Sweden, the mere existence of the SFPS is an affront to that finely crafted image. They do not want the people of Sweden to see that other opinions (those that do not conform to state orthodoxy) need and deserve protection as well. Sweden is really a soft Stalinist democracy, as long as you keep your head down and your opinions to yourself, you won’t be molested. But if you dare raise your head like the SFPS believes is everyone right, prepare yourself for the long knives. UPDATE: Exchange brewing in the comments between Roland Martinsson and Ingrid Carlqvist. Internationally, Sweden has earned the reputation of being a country that is so obsessed with political correctness that freedom of speech has essentially been abolished. The newly started Free Press Society, inspired by similar societies in Denmark and Canada, has caused both commotion and outrage amongst the dominating elite. Especially amongst journalists. It sounds like a tall tale, but unfortunately it is true. This is the story of how the Free Press Society became the number one object of hate amongst Swedish journalists. 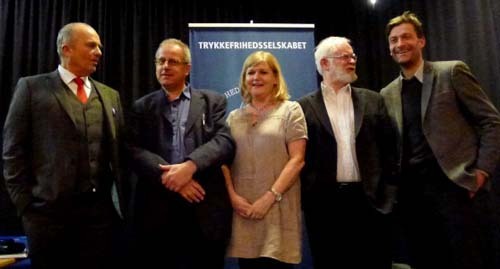 The Swedish Free Press Society was established in early 2012. The purpose is to defend and fight for freedom of speech by lifting many of the issues that are not covered by the mainstream media; and to make it a little easier for people to express uncomfortable views and opinions in the country of consensus. The press release about the formation of the Society was hardly released before all hell broke loose. But in the brief time period between the press release and our first meeting on January 31st there was a compact silence. Not a single word was written about the Society or the meeting. – The founder, Ingrid Carlqvist has a political agenda. – All the invited speakers are critical of the Swedish immigration policy. They are Islam critical, xenophobic lecturers. – The Free Press Society is ideologically close to the Sweden Democrats. They meet to discuss issues they consider to be true, but that aren’t permitted to be talked about in this country. Despite the complete absence of media coverage, and no advertising, more than 100 persons attended the meeting – which makes it a formidable success! Some reporters were present and in Sydsvenskan we could read – not what was said at the meeting itself, but what one of the speakers, Lars Hedegaard, had said at another meeting. The chairman of the Danish Free Press Society is one of the increasing number of Europeans put on trial for making critical statements about Islam. The final ruling of Højesteret (the supreme court) will be announced on Friday April 20th. * On February 2nd Petter Larsson at Sydsvenskan strongly urged us to disband the Society at our next meeting. * On February 2nd Lotta Wendel at Helsingborgs Dagblad wrote that our plan is to make ”the Danish muslim witchhunt into a Swedish one”. On February 3rd Johannes Nesser wrote in the Union paper Journalisten that journalists are unwillingly being added by SFPS to their Facebook group. Even though I explained to him that it is a result of facebook groupsettings (you are added by the administrator and can easily leave the group if you do not like it). Nonetheless he wrote the article in which he calls us Critics of Islam. * On March 8th the invitations to our second meeting went out. The topic was ”Gender research at universities – science or insanity?” One of the lecturers was Roland Poirier Martinsson at the think-tank Timbro, a Conservative critic of feminism and gender research. When his participation was revealed, a witchhunt against him broke out on Twitter. It was lead by the journalists Andreas Ekstrom, Sydsvenskan, Johannes Forssberg, Expressen, Anders Lindberg, Aftonbladet and free lance-journalist Annika Hamrud. * On March 12th Kaj Schueler of Svenska Dagbladet wrote that SFPS is not about definding freedom of speech and freedom of the press, but about using certain episodes to say general truths and extreme opinions and to feed prejudices. * On March 13th Annika Hamrud in Dagens Juridik claimed that SPFS has gone past the stage of litigiousness . * On March 27th Andreas Ekstrom at Sydsvenskan makes a frontal attack against SFPS and the undersigned. In a huge article in the Union newspaper Journalisten he claims that I have let my judgement do horrible things to my reputation as a journalist, that I see ghosts everywhere and that I am making a fool of myself. On Wednesday April 18th, The Free Press Society is arranging another meeting. The topic this time is ”The threats against our Human Rights” and the lecturers are Hege Storhaug from Human Rights Service in Norway, Mrutyuanjai Mishra, European master in Human Rights and Democracy, journalist and film maker Shilan Saidi and Bahareh Andersson who works with victims of honour crimes. The journalists are not interested in telling their readers, listeners and viewers about the event. The fear of the free word is apparentely huge among Swedish journalists. Previous Post Previous Post THE GUARDIAN PRINTS FALSEHOOD ABOUT GATES OF VIENNA……. Next Post Next Post SECRETARY OF FINNS MP HIRVISAARI IN THE CROSS HAIRS, A CASE OF SATIRE INVERTED BY OVERZEALOUS OPPORTUNISTIC MEDIA……..
As I have said a number of times, this rendering isn’t anywhere near the truth. I cancelled my participation freely, without being put under any pressure. My mistake was that I accepted in the first place, something I did of the simple reason that I had had professional contacts with Mrs. Carlqvist many years ago, during a time when her interests had not yet been focused on “the problem with Islam”. As soon as I found out what her society was about, I cancelled, simple as that. I have told Mrs. Carlqvist this a number of times, yet she continues to repeat her lies, which to me is further evidence that the judgment that once guided her in her career no longer is operating. After I cancelled my participation I have, however, received scores of criticism from Mrs. Carlqvists supporters, not always formulated in a polite or mature way. Let me humbly add that I think there are a few people in Sweden that will be mildly amused when they read that I supposedly fear the reactions of main stream media. So, can we put a stop to these lies now, about me cancelling because of external pressures? Or is seriousness and truth to the facts irrelevant to Mrs. Carlqvist also with respect to this tall tale – as they seem to be with so much else. This remark tells us everything. “My” society is about freedom of the press and freedom of speech, something that Mr Martinsson should support, not ban. Whatever he claims now, anyone could see that what happened on Twitter was that a group of journalists attacked him and told him that he could not speak at SFPS – because we are nazis, rasists, xenofobics and so on. At first Mr Martinsson protested and said that he was only going to speak about his opinions on gender research, but after a few hours of constant attacks on him, he changed his mind and cancelled his lecture. Of course he will say he did it because he found out that we are a bunch of nazis, rasists and xenofobics. It is not true, but the truth has a very small place in the minds of Swedish journalists. A person who can’t read for himself what SFPS is all about but forms his opinions on what is being said on Twitter and in a Facebookgroup, does not deserve respect. National Socialists? Whoever said that deserves a nice, clean libel case against him.